Do you remember pork skewers? Of course you do! 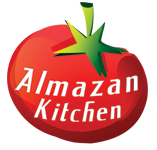 Let’s make a chicken one, in a Greek style with a note of AlmazanKitchen improvisation! Coal-grilled chicken skewers infused with refreshing spicy marinade, simple and delicious! All made from scratch next to a stunning winter scenery near the mountain river. Recipe is below! Prepare some sharp sticks by using knife. Prepare you mortar & pestle. Load in ½ tsp. of salt, 1 tsp. of coriander seeds and 1 tsp. of caraway seeds. Grind everything well! Add some lime’s zest and a lime juice. Mix well until rich texture. Take 500g of free-range chicken breast. Slice & dice it. Dip in the marinade and let it marinate for few hours. Take some bell peppers in a different colors. Dice in major pieces. Preheat the grill on coals. Cook the skewers until crispy golden brown texture. Do not forget to flip it. Take handful of fresh spinach, dress it up with 2 tbsp. of aged balsamico. Place the chicken skewers on the spinach “pillow”. Add some olive oil.